They make cards for just about everybody these days. There are cards of presidents to explorers, leaders to innovators, famous events to obscure celebrities. The rarest cards come with limited autographs. 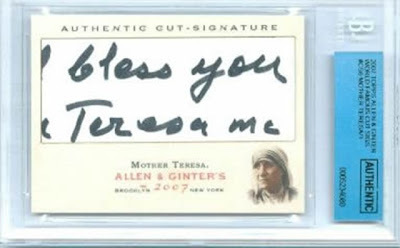 Above and below is a 1 of 1, 2007 Topps Allen & Ginter Cut Signature of Nobel Peace Prize Winner Mother Teresa. 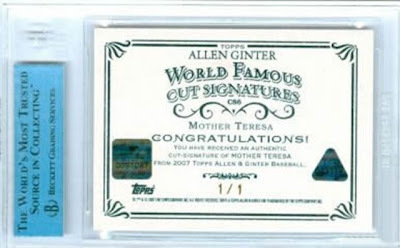 This particular card sold on eBay a couple of days ago at $10,099.99. Of special note: This card was pulled from a pack a couple of weeks ago at the 28th National Sports Collectors Convention in Cleveland by Dave and Adams Sportscards. Sports Collectors Daily has set up a online video channel on magnify.net geared to the collector. He's got some great collector videos there. Check it out here. Below some collectors show off their stuff. Todd McFarland shares his rare homerun ball collection. What ever happened to the "Mookie Ball." Check it out below. Following a night where he hit 3 doubles and recorded 2 RBI's, Jeff Kent started the scoring Friday evening with a solo homerun in the 2nd inning. Five more Dodgers would follow him with hits as the Dodgers sprinted to a 5-0 lead after two. The Dodgers have started to look alive these past three days and the results show. They have a three game winning streak having scored 6 runs in each game. The Dodgers have recorded a total of 29 hits that includes 9 doubles and 3 homeruns. Eric Stults was masterful in his 7 innings last night. Broxton was sharp in his one inning. Proctor faltered a bit, giving up two runs, but the magic hands of Saito saved the day. He recorded his 32nd save of the year. The Dodgers won the game 6-4. Once again hope is renewed as the Dodgers look ready to finish this marathon strong. Unfortunately, as with any season, questions still remain. Will the pitching staff stay off the injured list? Can our hitters remain consistent? Can our rookies come through in the stretch? I just hope it isn't too late. We are 6 1/2 games out of first and 2 1/2 games behind in the wild card race. 40 games are left in the season and time is getting short. All I know is that I'm crossing my fingers and praying to the great Dodger in the sky. This Dodger fan earns his stripes as he represents the Blue in the midst of a hostile Giants crowd. A Blue Heaven Sleepover! Below is video from this years second annual event. The Pavilion Pimps invade San Francisco. Below is a link to a promo video for a documentary about The Duke.